Hello Queen's! With the busy year coming to a close, we wanted to commemorate the efforts of everyone in supporting T-ara. Since its the holidays, why not do a giveaway? We're giving those who weren't able to snag T-ara's mini-album the chance to get their own copy for FREE! Even if you already have another copy, why not get one for a friend or family member? After all the holidays are all about the gift of giving right? We will be giving out THREE (3) copies of T-ara's latest mini-album AND&END contributed by our generous staff writer, Vance! Reply to this Portal article. * Following/Liking is a part of the requirement. If chosen in either of these categories, we will check if you have done so. Make sure your Twitter account is public! We will otherwise not be able to see RTs made by private accounts. Similarly, make sure your Facebook account is public in order for us to contact you OR have a valid contact email address listed in your About page. Each of the three categories is a giveaway for a separate album. You can enter in any one or all three, but a person can only win one album from the giveaway. Participating in multiple SNS categories is encouraged because that means more chances for you to win! You are only allowed one entry per category. Creating multiple accounts or entries is prohibited and you may be at risk of being disqualified if discovered. The giveaway will be held from December 15th till the 31th, so make sure to participate when you can! We'll choose a winner from each SNS category and contact you for shipping information. If you have any questions feel free to contact the staff. Thank you and good luck! 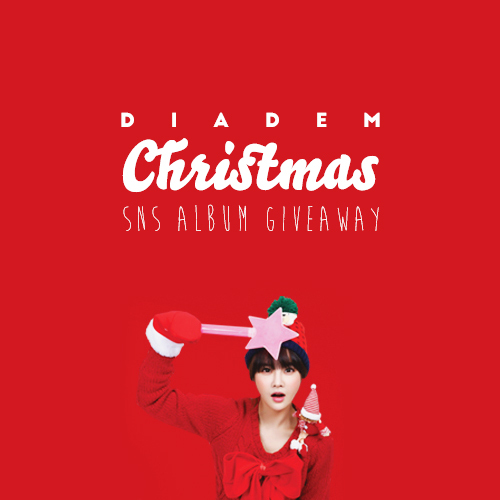 Diadem let me have this album~!